books that will keep you motivated in your career journey! I've had a love for reading every since I was a little girl..I have shelves and shelves of books at home that I've collected throughout the years! However, while I was in college, my desire to read leisurely was quickly lost. Now without the stress of mandatory reading about things I have no interest in...I'm back to reading for my own enjoyment! However, this time around, instead of reading about love stories and fiction..my book interests have appeared to switch to titles that are more focused on bringing motivation and inspiration to my career journey. In this post I wanted to share with you all the latest books that I've enjoyed, as well as one that I just recently began and am already loving! I've realized that each once of these books has come to me at the perfect time in my journey and I can credit them all for giving me that additional confidence boost right when I needed it. Click READ MORE below to find my book reviews! 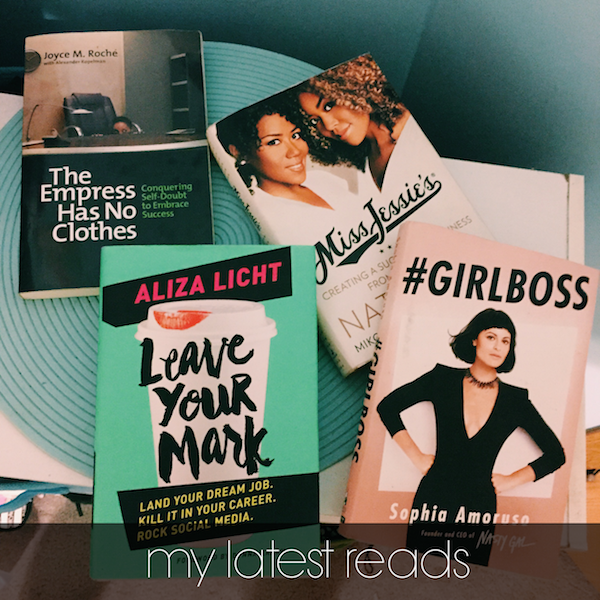 #GIRLBOSS: I began reading #GIRLBOSS after hearing about it through a fellow intern at the PR firm that I interned for directly after graduation last summer. I was at a very weird transitional point in my life..I had just graduated college..my summer internship was soon ending and all I could think was "ummm, what next?" I wasn't as much in love with the idea of working at a PR firm as I once was when I began college and I was just flat out confused. Nasty Gal founder, Sophio Amoruso's book couldn't have been introduced to me at a better time. She perfectly expressed the feeling of being directionless and unmotivated professionally...and in her case she decided to create her own lane and eventually become the founder of a multi million dollar online business. I felt so inspired after finishing this book and I know that no matter where I end up in my career..I'm always going to strive to be a #GIRLBOSS. The Empress Has No Clothes- Conquering Self-Doubt To Embrace Success: I found out about this book through my favorite career mentoring site, Levo...and I'm so glad that I did! The author Joyce Roché, is an amazing woman who went from humble beginnings to earning an Ivy League MBA. She then went on to become the first female African-American vice president of Avon, president of a leading hair care company, and CEO of the national nonprofit Girls Inc. Joyce wonderfully touches on imposter syndrome and overcoming unnecessary self doubt in your career. I fell upon this book at such a vital time...when I was just beginning my first career job as a marketing coordinator. Not only does this book give us the background on her own career obstacles, but it features short inserts from many other important professionals who you would almost not believe ever experienced self doubt. This was an amazing read and I would recommend it to everyone, from those that are just beginning their career, to those planning on making a major career move in the near future. Miss Jessie's- Creating A Successful Business From Scratch: I fell in love with Miss Jessie's products before I even said goodbye to the creamy crack. I interned in New York City after my junior year of college at a PR firm that represented the brand. After being around all of the products for months and having to do so much research on the brand, I was actually inspired to wear my naturally textured hair. So you can only imagine my excitement when I learned that Miko, one of the founders of Miss Jessie's was going on a book tour and the first stop was Chicago! This book is special to me because I was able to get it autographed and even take a photo with it with the author. It was so interesting to be able to learn more about the backstory of a brand that I love so much...from how Miko and her sister Titi went from making Miss Jessie's products in their kitchen to getting them on the shelves at Target and numerous other retail stores. Miko didn't hold back a thing, sharing so many personal details, so that readers would truly understand that it was not an easy feat. Most importantly, she was able to honor her sister's memory with this book. I am extremely inspired by the bravery of entrepreneurs, especially woman entrepreneurs, so this book only helped me fall in love with Miss Jessie's even more. Leave Your Mark- Land Your Dream Job. Kill It In Your Career. Rock Social Media. : This just happens to be the latest book that I'm reading, which I found out about through a fellow blogger on Instagram last week. I've just begun and I'm already really enjoying this book! It's written by the social media maven and DKNY PR Girl, Aliza Licht. I feel like this book is the perfect read for me right now as I continue to get settled into my career and build my blog. Aliza shares with readers that this is not a "How-To" but a "Must Do". I'm very excited to continue reading and soak up all the advice and mentorship that I can! I don't know if my comment went through the last time but I just wanted to say that I'm really grateful for this post! I have read (& reviewed) 2 of the books you listed here & reading your reviews of them makes me eager to read more. Definitely adding The Empress Has No Clothes to my list up next.